HoloLens offers a unique AR experience. It's great build quality and attention to detail are pluses, and the application potential seems limitless. It's now a matter of whether Microsoft can fix some nagging issues, and how much it will cost regular folks. HoloLens, Microsoft's augmented reality (AR) viewer, feels like the future of computing. Being upfront, the headgear that I tried at Build 2015 was "early development hardware," and it definitely felt that way. But the potential, and how close HoloLens is to achieving it, is simply remarkable. The moment I tried on HoloLens during a "Holographic Academy" session with fellow journalists, I thought, "This is like having a PC on my face." It's not quite that functional yet, but that's how the headgear, and what you see and can do with it, makes me feel. There was no gaming in the session I attended, like we've seen since (more on that later). Instead, I was a developer for 90 minutes, crafting an app in Unity and adding HoloLens functions as I went. With every new function added, like gesture controls and spatial sound, I witnessed how it translates into the HoloLens experience. The session aimed to show how easy it is to develop for HoloLens, but it also demonstrated what you and I will experience once it's out. But, before we get into the nitty gritty, let's hit the latest news around HoloLens. 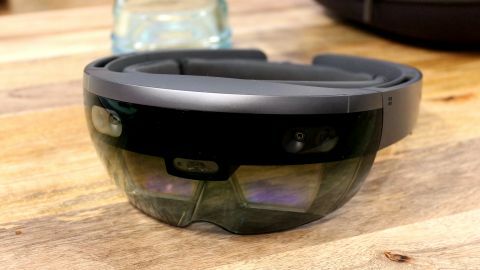 Although HoloLens is available for developers to buy right now, albeit for the ungodly price of $3,000 (£2,719, AU$4,369), Microsoft has kept rather quiet on its progress beyond the applications of creators. Nevertheless, software engineers have welcomed the “mixed reality” headset with open arms. That includes those of medical technology firm Scopis, who has debuted the first-ever mixed reality interface for spinal surgeons. Using 3D position tracking, the Scopis overlay aids in accurate alignment with minimal distraction. The company says that its HoloLens overlay system reduces not only surgery time, but patient exposure to radiation as well. Peering into the future, Apple is finally posing as a sufficient rival for HoloLens as well. In fact, at WWDC 2017, the Cupertino company revealed ARKit, an app that helps developers create augmented reality experiences, replete with “fast and stable motion tracking.” There’s no telling whether this move could result in a competing AR headset from Apple down the line. HoloLens is essentially comprised of two rings: a thicker, plastic outer one that contains the guts and a slimmer, cushioned inner one that wraps your head. The inner ring's fit adjusts by sliding forward and backward a roller residing on its back. That cushioning is a small touch, but one I appreciate for making it easier to forget you're wearing the viewer and focus on the AR imagery in front of you. The device isn't supposed to sit on your nose, but I found its rubber nose guard to inevitably fall down my nose no matter how often I pried the HoloLens forward. Thankfully, it's optional and comes off easily. HoloLens feels a lot better for me with it off. It looks like it belongs in the office but would blend well in any living room. I also struggled to get HoloLens to fit every time I put it on. I had to regularly re-tighten, re-situate and realign the headgear. When everything fit nicely, the AR imagery was in full view and it felt right. But if it was too tight, too high up or too far forward, my experience was hindered. Standing still made for the best overall viewing experience. The adjustment issues cropped up especially when I would move around, effectively defeating the point in HoloLens. If you have short hair or it's pulled back, you might not have as much trouble as someone with long, loose hair, like myself. It may have been my ability to adjust, but I had a slight headache after I took HoloLens off, like I had been wearing a baseball cap that was two sizes too small. The headgear I used was untethered, and I didn't need my hands for anything other than selecting my "hologram" to move it. It wasn't wired up for battery life, like the first early prototypes shown to press. Fitting issues aside, when HoloLens fits right, it's comfortable. But, like all virtual reality (VR) and AR headgear, its weight is front loaded. You can't help but feel a noticeable weight hanging off your forehead. The weight isn't uncomfortable, but it is significant. If Microsoft can somehow counterbalance the weight on the sides or back, it would likely alleviate the front-heavy sensation. I wear glasses, and I used HoloLens with them on. They don't press into my face or feel tight around my head, unlike with most VR headsets. I also didn't get nauseous, a frequent occurrence when I wear Oculus Rift. It helps that I can still see my surroundings with HoloLens, so I don't feel disoriented or claustrophobic. If only the HoloLens see-through screen weren't so dark (but the room was dimly lit, so it may be just right for a brighter room). Walking backward in HoloLens feels most uneasy, as I can't quickly turn to see whether something is behind me. The headgear also obstructs my upper peripheral view, so some of my vision is obscured. HoloLens looks and feels like a premium device. Nothing about it screams "cheap", which is reflected by the developer edition's price. The gadget looks like it belongs in the office but would also blend well in any living room. As is, HoloLens feels too delicate to stay clean and unscathed in, say, a construction site. I find myself handling HoloLens gently, so unless Microsoft does some ruggedizing, you'll probably want to keep HoloLens out of the reach of youngsters. The "hologram" – which these are not by the strictest definition – in my HoloLens experience consisted of two floating spheres, two yellow slides and some blocks stacked on a pad of paper. It was called "Project Origami," and so was meant to look and sound like folded paper. To give the holograms (which turned into a game) functions, I added controls (gaze, gesture and voice), spatial sound, spatial mapping and the ability to pick up, move and place the holograms around the room. This wasn't Minority Report-level selecting and swiping, but impressive nonetheless. Finally, an underworld was added to the hologram so that, when the spheres fell, an explosion created a gaping hole in the floor that the they descended into. Looking down the hole revealed a new world, complete with rolling hills and cranes soaring underneath my feet. The HoloLens images projected onto the real world around me are vibrant, sharp and realistic – though, a little jittery. When I move around them, the holographic shapes behave like real objects, so I can see their backsides – or not at all, if they're obstructed by other holograms. When the paper spheres roll onto the floor, they roll around just like real balls would, bouncing around objects and looking real enough to pick up. When I peer into the underworld that opened up on the floor, it's like I'm looking into, as my HoloLens "mentor" put it, a world I didn't know was there the whole time. But, looking at holograms slapped on top of the real world is just one half of the HoloLens equation. Controlling the holograms is the other. The HoloLens gaze controls are responsive and should be easy for any user to get the hang of almost immediately. It's the other kinds of input where HoloLens has slightly more trouble. While voice controls work, there is a lag between giving them and the hologram executing your commands. I had to say, "Let it roll!" to send the spheres down the slides, and there was a second-long pause before they took a tumble. It isn't major, but enough to make me feel like I should repeat myself. Gesture control is the hardest to get right, even though my experience was but a one-fingered, downward swipe. It took time to figure out the best distance to swipe away from HoloLens and where to put my finger for it to register. Just imagine someone repeatedly swiping their finger downward in mid-air – that was me. Once I finally found the sweet spot, though, the control worked better than expected. Instead of reaching out to touch the hologram, the swipe worked best when I held my hand comfortably in front of me. Using gestures, I could select the Project Origami diagram, use my gaze to move it around the room, and then use another pinch to lock the hologram into a new spot (I moved it from in front of me to a couch to a coffee tablet to a desk.). This wasn't Minority Report-level selecting and swiping, but impressive nonetheless. The HoloLens uses spatial audio, which takes the experience to a whole new level. Ambient music played during the demo, and the spheres rolled to the the sound of crumpling paper. The sound got louder as I approached the hologram and faded as I moved away. It added another dimension to the HoloLens experience, making it that much more immersive. Of course, as I viewed the holograms, I was still able to see my surroundings. The holograms weren't disrupted if someone happened to walk through my projection. My favorite part of this HoloLens demo was a wire frame mesh that appeared on real-world objects to show how HoloLens perceives them. The mesh changed as HoloLens registered the objects and I moved my head to look at a new spot. It also wrapped the people around me, though I could still make out their features from behind the digital framework. It was an awesome AR moment: the people themselves became part of the hologram. As cool as it all was, it would have been less distracting if the images disappeared when I was talking to someone. From speaking with Microsoft representatives, it sounds like this will be possible with other apps, but not Project Origami. It feels weird to talk to someone with HoloLens on – a little rude, as if I were wearing sunglasses indoors (or at night – zing). The biggest issue with HoloLens's holographic viewing is that the field of view is limited to what amounts to the size of a monitor in front of you – equivalent to 15 inches, we know now. You can see the edges of the virtual space where the hologram lives (which are basically the edges of the inner HoloLens frames). Looking outside that space, or moving too close into it, cuts the the hologram off or makes it disappear completely. These edges weren't visible during the wire mesh portion of the demo and therefore was more immersive, but the origami demo seemed as if it existed on a limited plane. The holograms look best when I'm standing about four or five feet away and when there is more going on, like the wire frame mesh. There were glitches in my demo, and it didn't work perfectly every time. Regardless, none of its takes away from my enjoyment of HoloLens – demos are always incomplete. It's important to note that, while Microsoft's on-stage HoloLens demos have featured polished and seemingly advanced holograms, what I saw was not in the same league in terms of quality, complexity or functionality. Maybe Microsoft is saving all the wow factor for its keynotes, but my demo was a less refined and less capable version of what we've seen in on-stage demos. My experience, while impressive, felt like child's play AR compared to what's been in Microsoft's keynotes. That's not to say that HoloLens can't project these advanced images down the road. And, as Microsoft said, I was wearing "early development hardware." But Redmond has work to do to before the reality it's projecting onstage aligns with what you and me actually see. Neither the HoloLens software nor the hardware is perfect. But, if Microsoft can work out the kinks, HoloLens will be an immersive entertainment device that could easily fit in an office. Despite its faults, using HoloLens was delightful. With more robust apps, more reliable functionality and an improved viewing experience, HoloLens could become the AR viewer to end them all. Frankly, HoloLens could transform how we interact with the world. These are lofty ideas, and the device as-is won't accomplish any of them yet, but the potential is there – and strong. HoloLens is the most fascinating tech I've tested in a long time. We still don't know how much it will cost at retail, but HoloLens seems to have unlimited potential – that which it seems like it can actually live up to. And that alone is incredibly exciting. Head to Page 2 for our brief impressions of a few more recent experiences with HoloLens.